There has been a lot of chatter recently about ageism and the old vs young debate in tech. The New Republic has a post up today on the topic. And last week the New York Times Magazine featured a long article on the topic. There is no doubt that tech is a young person’s game to some extent. And there is no doubt that VCs are biased towards younger founders and against older ones. However, it’s not an absolute thing. I’ve written about this before here at AVC. At USV, we have backed founders in their teens, 20s, 30s, 40s, and 50s. I think we would back a founder in her 60s or 70s too but we have not yet had that opportunity in an investment that made sense to us. The Gotham Gal recently backed a founder in his late 60s. I am pretty sure that will be a good bet. I saw this graphic on Tumblr today. It made me happy. Ray Kroc started McDonalds when he was my age (52). My point is this. Yes tech is biased toward younger people. To some extent, USV may be biased in that direction. We have not done a distribution of the ages of the founders we have backed but I suspect it would weight a bit toward the younger ages. My bet is that the median age of the founders we have backed would be mid 30s. 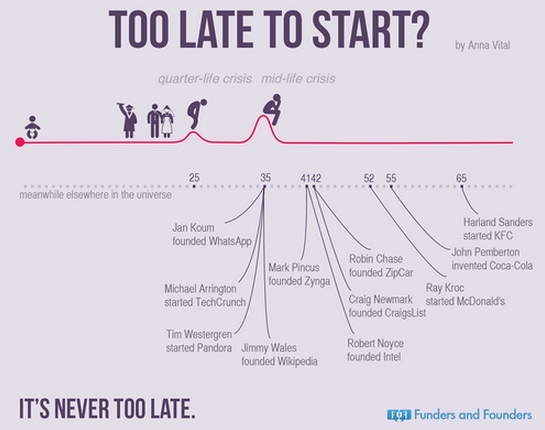 But as this graphic shows, you are never too old to start a company. And I promise you that USV will consider any investment in our sweet spot (large software based networks) regardless of the age of the founder. Age is a two way street. Youth brings some positives. But age brings experience. And that is a pretty valuable thing.